January 12, 2015 By Allyson 3 Comments This post may contain affiliate links. Read my disclosure policy. As a working mom with two kids, I always struggle to get breakfast in the morning. I am usually up by 6am at the very latest, and then by the time 11am rolls around, I realize I still haven’t eaten, and I’m starving. Finding a breakfast that would keep me full until lunch time was no easy task. So, after I had my second son in July, I started looking for easy solutions. 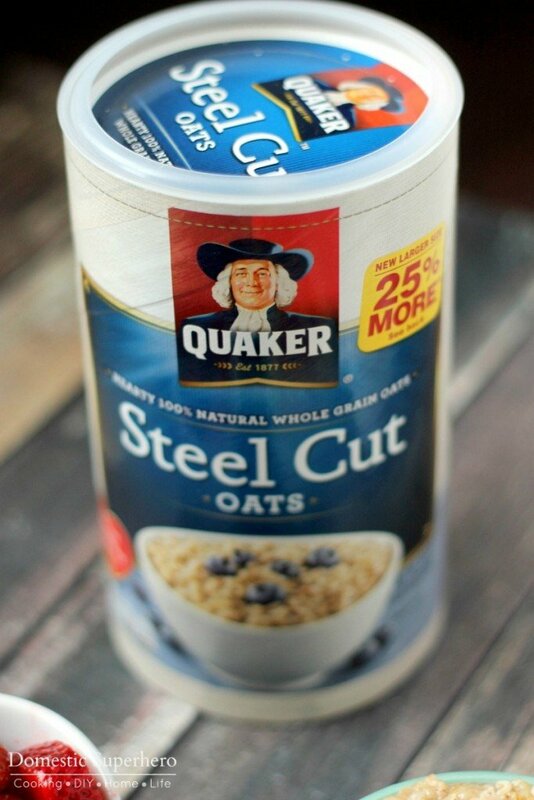 I heard about Quaker Steel Cut Oats and thought it would be a great option for me. I headed to Target to pick up some of the Quaker Steel Cut Oats. In Target there was even a display featuring Quaker Steel Cut Oats along with several recipe cards. 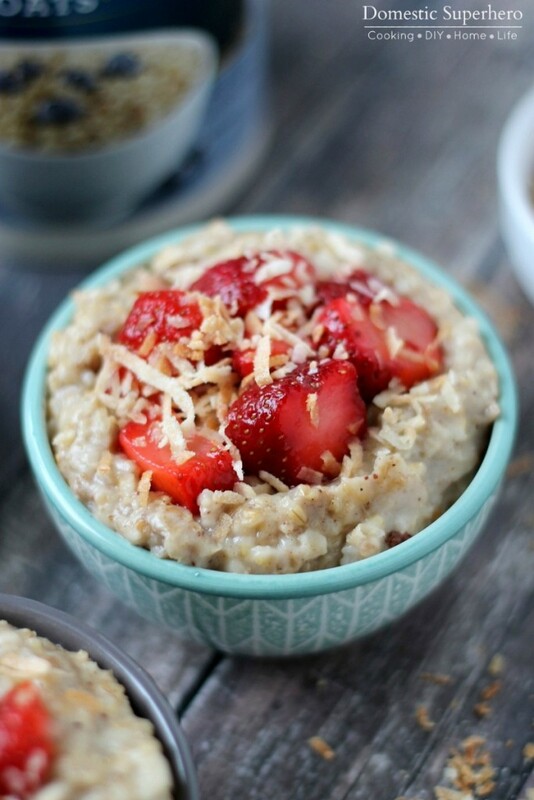 They all looked delicious, but I had a recipe of my own in mind; Slow Cooker Creamy Coconut & Strawberry Steel Cut Oats. 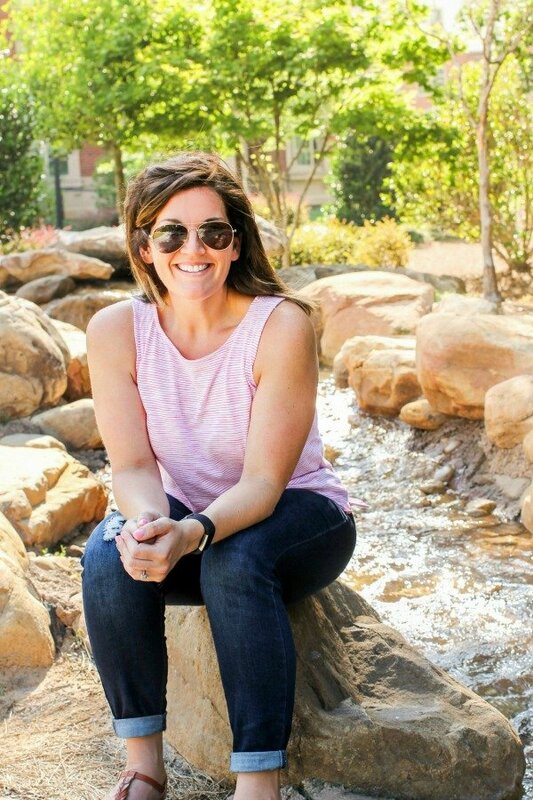 Seeing that time is really important to me (working full time, 2 kids, a blog..you know, the usual! ), I decided to whip these up in the slow cooker. This way, I set it right before bed, and woke up to a delicious meal! I had no excuses not to dig in and enjoy! 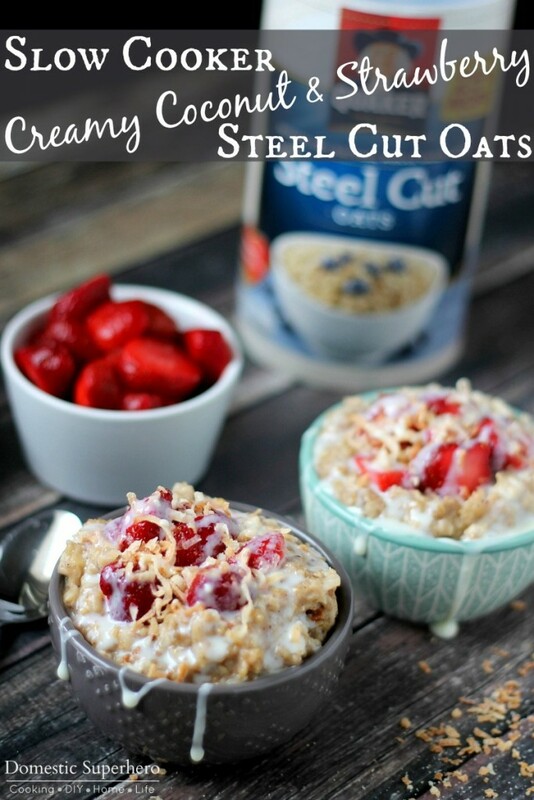 I prepared these steel cut oats with low fat coconut milk, which take these oats to the next level. It adds such a decadent creaminess that is so good. 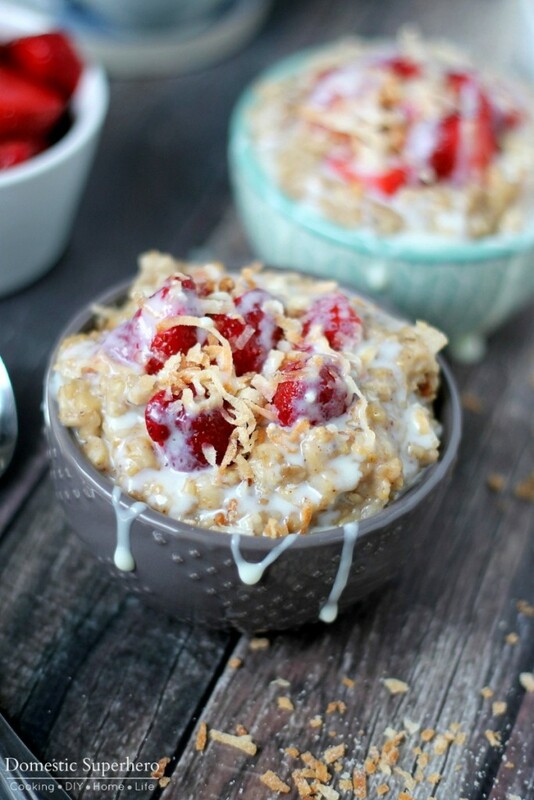 After the oats were done in the morning, I topped them with some delicious toppings; strawberries, toasted coconut, and low fat sweetened condensed milk. I read somewhere a while ago about using sweetened condensed milk with oatmeal, and I happened to have some left over from another recipe, so I tried it. I am so glad that I did, because it pairs perfectly with this recipe and really brings everything together. Of course, you could use other fruit; blueberries, raspberries, peaches (ohhh, peaches and cream! ), bananas…they would all be great options. Or you could use them all! Target also has some fun options (chia seeds, goji berries, fried fruits, nuts) to add to the Steel Cut Oats, so I would love to try those as well. All in all, this recipe is quick, easy, and good for you! What more could you ask for? 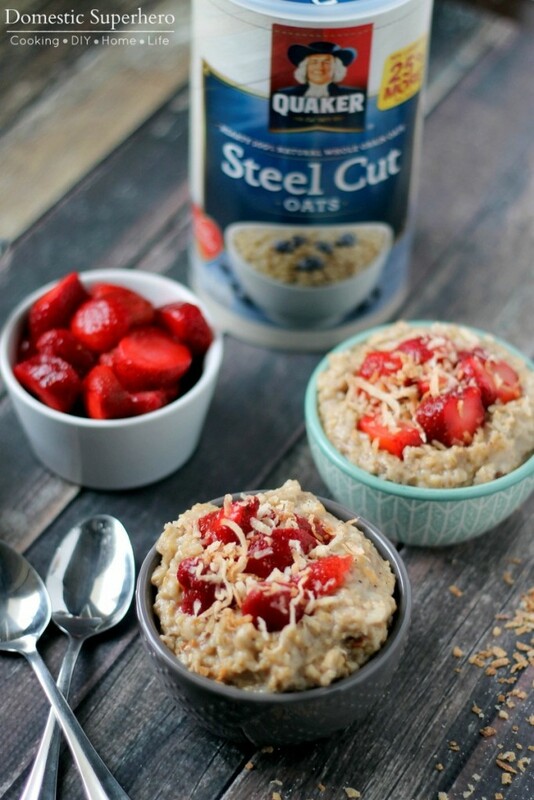 I love these Quaker Steel Cut Oats and now I have no excuses to skip breakfast! 1. Spray inside of 3-1/2 quart (or larger) slow cooker with cooking spray. Add oats, coconut milk, water, brown sugar, butter, cinnamon, nutmeg, vanilla, and salt to slow cooker. Stir until mixed, cover, and cook on low for 7 hours. 2. Remove cover, add sliced strawberries and mix using a spatula. Spoon oatmeal into bowls, top with toasted coconut and a tablespoon of sweetened condensed milk. Dig in! To reheat single servings: Put 1-cup cooked oatmeal in microwave proof bowl. Add 1/3 cup milk or water. Microwave on high for 1 minute and stir. Continue cooking for another minute, or until hot. I love easy breakfasts so this recipe is just ideal for me. Thanks for sharing it!